We recently got to over 2000 code examples and libraries on Libstock. 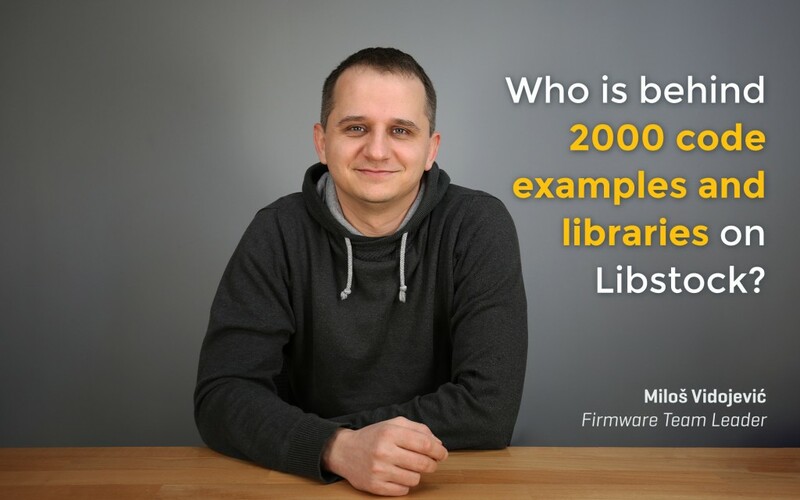 With another milestone reached, we thought it's time to hear what the man behind hundreds of libraries on Libstock has to say. Miloš Vidojević, the team leader of our firmware team, shares his thought about Libstock, the newest PIC compiler update, mikroSDK, and his plans for the future. You'll learn why Libstock Manager was created, and what the biggest benefits of using it are. 1. The number of code examples and libraries on Libstock keeps growing. Why is this good for the user? "The answer is simple – more libraries, code examples, and demo applications there are, the bigger the chance you will find exactly what you need. Of course, it’s not always possible to find the perfect solution to the problem, but you can use something similar that leads to a conclusion. When we take our Click board™ product line into consideration, which has over 400 different add-on boards, along with the fact that each Click board™ comes with software support (libraries, examples), one can say that Libstock has great coverage. Other than this, there are general purpose libraries, like Ethernet or FAT32, where the sheer number of downloads speaks enough – over 30.000. On top of that, there are projects that our users uploaded, that take up more than 50% of Libstock. When I look at the big picture, I can safely say that as a website, Libstock got to a point where any embedded developer who is looking for a solution is bound to find it there, and use it." 2. We recently released a new update of the PIC compilers. Can you share your opinion about it? “I can’t have anything but a very positive opinion, considering I worked on that project,” says Milos with a cheeky smile. “All jokes aside, I think I am more suited to say what the general idea behind the update was, and what we intended to do with the Libstock Manager. First and foremost, we wanted to make a tool that saves the user’s time. In this particular case, the library installation and running the demo application. The whole process was brought to a few clicks. Along with that, the time the user needs to spend is minimal. It goes well with our BE ON TIME company motto. Second, by no means less important fact, is that right now inside the PIC compiler IDE you have all information about available libraries. This means you can install a library directly from the IDE and continue with your work. Convenient, isn’t it? You’ll get notifications about new libraries, and updates of existing libraries in the same place. Perhaps this sounds like with the update we made Libstock secondary compared to the compiler, but that’s not the case. Just think of the fact that without Libstock none of this would be possible. All things put together, I think that this is a useful innovation – not only because it makes the process easier and saves time, but because all the necessary components are in the same place." 3. How does mikroSDK fit into this picture? "mikroSDK (a software standard for developing portable libraries) allows an existing library to be used on a different microcontroller or architecture, without any major changes in the code. Leaning on the mikroSDK we managed to bring forth our dream of making a code example for each programming language and architecture supported by MikroElektronika. That is seven architectures, on three programming languages. It’s quite clear that mikroSDK multiplies the number of available libraries. Basically, this means that every future Click board™ library is made according to the mikroSDK standard. At the same time, we are updating previous Click board™ libraries to be mikroSDK compliant. The users who are already working with Libstock Manager noticed this. They get a notification every time, whether it’s a new Click board™ library or an update of an old one. One of the major advantages is that a user can share their mikroSDK compliant project with other users no matter which architecture he used. Of course, I don’t expect that everyone starts using the mikroSDK right away. A period of adaptation is needed for people to get used to it. This can mean that third-party libraries will be available through the compiler IDE, but it’s too early to discuss it at this stage." 4. What do you have in the pipeline right now? Any new projects and ideas? "We have a lot of new things planned, but at this moment we are discussing how to make the search inside Libstock better. With the number of libraries and code examples constantly growing a search optimization is a real necessity. Perhaps this sounds like a simple task but, take into consideration that you can upload projects for seven different architectures (Mikroelektronika compilers and others) on three programming languages. That for the ARM architecture we support five different vendors and that each Click board™ in our range has a different functionality. When you add all this up, it’s clear that the task ahead is not an easy one. But we will do it, the whole team is up for the challenge." This is how Milos sees the benefits of Libstock, mikroSDK, and new PIC compiler. Let us know on Facebook and Twitter what you think. It's been a long road from the summer of 2011 when we launched Libstock until now. We got to 2000 code examples and libraries with persistent work, lots of enthusiasm and bold ideas. You can take this as an inspiration for your own work - because each step counts. To learn more about Libstock, visit the About Libstock section.